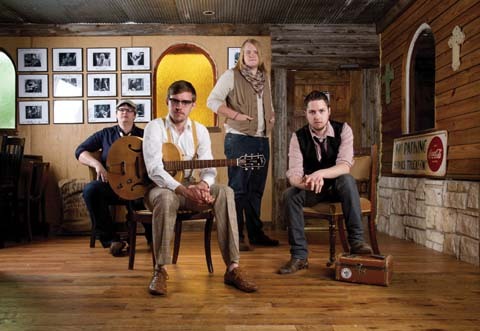 Led by Uncle Lucius, roots rock music has made a triumphant return over the past couple years in Texas. Folk Family Revival is a band that is in that realm. FFR is comprised of brothers and a friend. This closeness comes through in their music, songwriting and especially their harmony. We like using the Greenfest stage to showcase bands that you should know more about right alongside established acts, and FFR is somewhere in between. They’re going to bring the rock and have the songwriting chops to back it up. We are excited to see what they bring to GF14 and expect them to rock the house. FFR is the main reason we are coming to Greenfest. Love! Love! Love them! So excited to see them and get introduced to some new bands! What an amazing video, excited to see you at Greenfest, you guys are always more than entertaining. this website is really pleasant and the users are in fact sharing pleasant thoughts. Generally I don’t read article on blogs, however I would like to say that this write-up very forced me to try and do it! Your writing style has been amazed me. Thanks, quite great article. I just want to say I am all new to blogging and site-building and absolutely enjoyed your web site. Very likely I’m planning to bookmark your blog . You amazingly come with fantastic stories. Kudos for sharing with us your blog. I simply want to mention I’m beginner to blogs and absolutely loved you’re web page. Very likely I’m planning to bookmark your website . You definitely have beneficial well written articles. Thank you for sharing your webpage. Whats Going down i am new to this, I stumbled upon this I have found It absolutely useful and it has aided me out loads. I’m hoping to contribute & aid different users like its aided me. Good job. Just want to say your article is as astonishing. The clarity in your post is simply cool and i can assume you’re an expert on this subject. Well with your permission allow me to grab your RSS feed to keep up to date with forthcoming post. Thanks a million and please carry on the enjoyable work. Hiya, I’m really glad I’ve found this info. Nowadays bloggers publish only about gossips and web and this is actually irritating. A good blog with exciting content, that is what I need. Thank you for keeping this website, I will be visiting it. Do you do newsletters? Can not find it. I have read a few good stuff here. Definitely price bookmarking for revisiting. I surprise how a lot effort you place to create this kind of excellent informative web site. I have been exploring for a little bit for any high-quality articles or blog posts in this sort of area . Exploring in Yahoo I eventually stumbled upon this site. Studying this info So i am happy to convey that I’ve a very just right uncanny feeling I found out just what I needed. I most indubitably will make certain to don¡¦t omit this site and provides it a glance on a constant basis. I do consider all the concepts you have offered on your post. They’re really convincing and will definitely work. Still, the posts are too short for starters. Could you please extend them a bit from next time? Thank you for the post. Hello very cool website!! Man .. Beautiful .. Superb .. I will bookmark your web site and take the feeds additionally¡KI’m glad to find a lot of helpful info here within the submit, we’d like develop more techniques on this regard, thank you for sharing. . . . . .
Hello.This post was extremely fascinating, particularly because I was looking for thoughts on this issue last Thursday. I’ve been surfing online greater than 3 hours lately, but I by no means discovered any interesting article like yours. It is pretty value enough for me. Personally, if all web owners and bloggers made excellent content material as you did, the internet will likely be a lot more helpful than ever before.